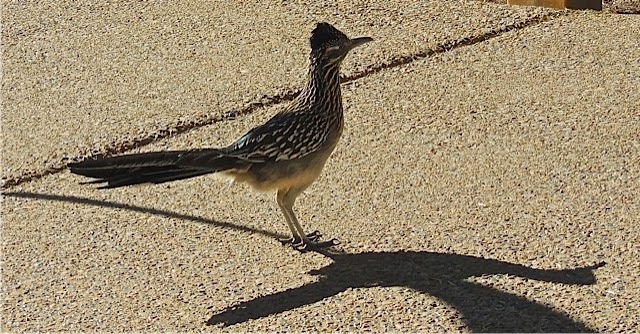 My friend the roadrunner stopped by to see me….briefly! He saw his shadow and ran off. I wonder what that means. 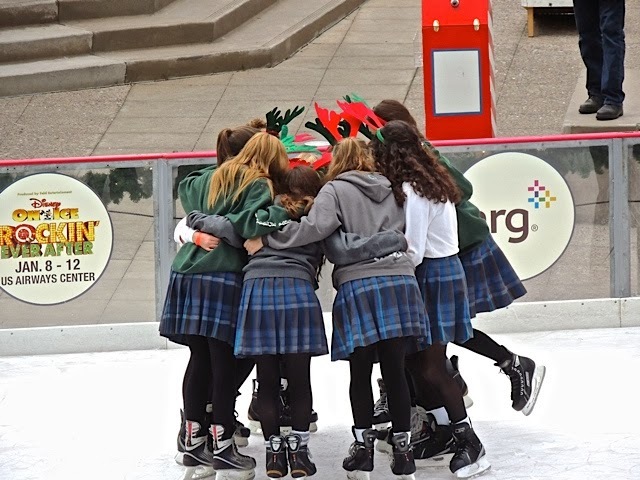 I can't believe we are wrapping up another year. When I was about 10 or 12, I remember figuring out how old I'd be in the year 2000. At that time, it seemed very old and very, very, far away. In reality, it just flew by. Is everyone ready for their photo of the year tomorrow? Today marks my 2000th post on Phoenix Daily Photo. It's hard to believe that I've posted over 2000 photos on this site. And, I'm still enjoying the challenge of finding interesting things to photograph and post. 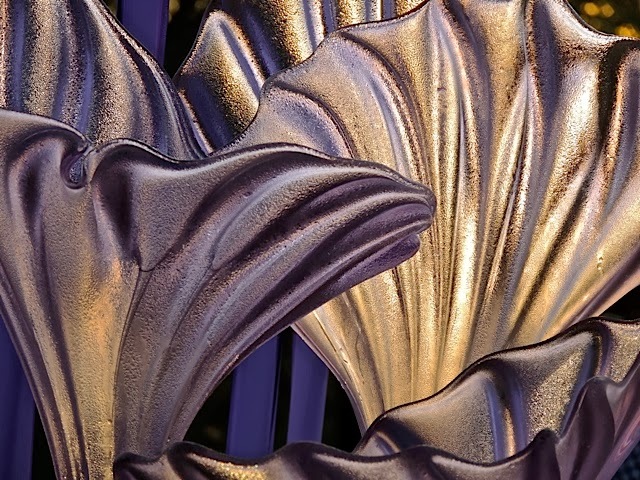 Today I have an artistic shot taken close up on one of the Chihuly pieces at the Desert Botanical Garden. This one was taken on that day I went early in the morning during the members only hour. The sun was coming up behind this glass and it made the piece glow. The Queen Victoria Agave has to be my all time favorite agave plant. 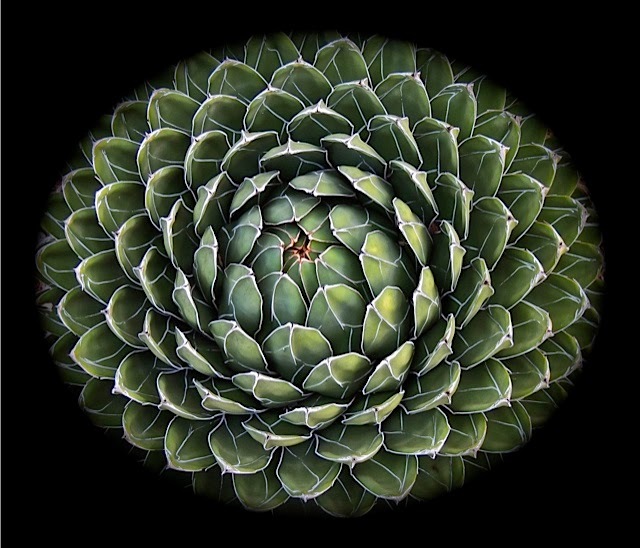 With my love of patterns, the perfect symmetry of this plant is just too appealing to resist. 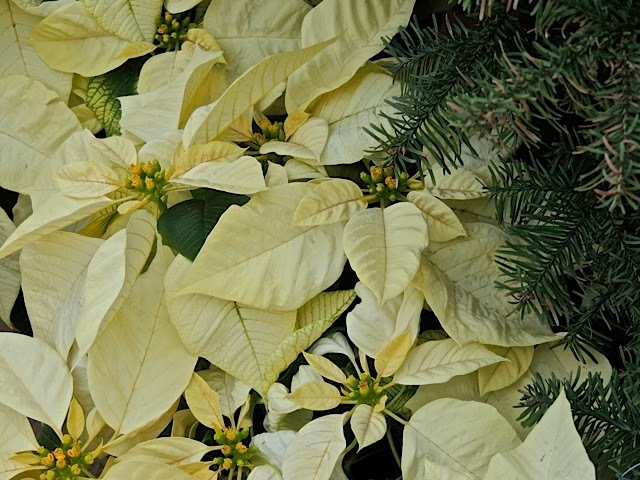 I took this photo looking straight down on the plant and then I gave it a black border to make it pop. I think this one was even more perfect than most of them. I have a new post on Sharon's Sojourns today. You can see how my plans for the perfect photo in Brighton had to be put on hold for another time. 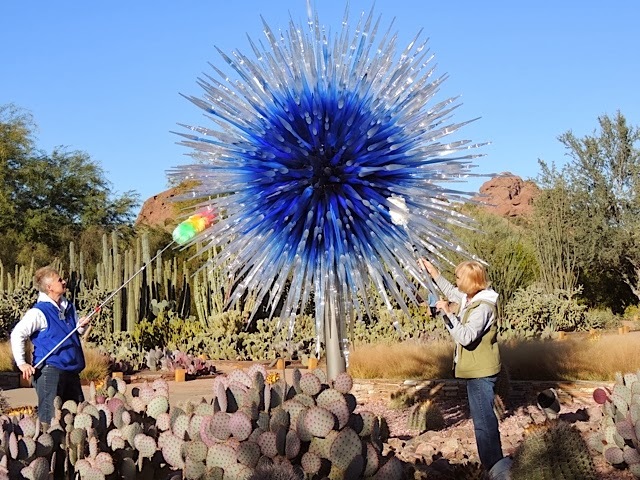 I went to the garden yesterday to go for a walk and I happened to be there when the cleaning crew was out dusting off the Chihuly sculptures. 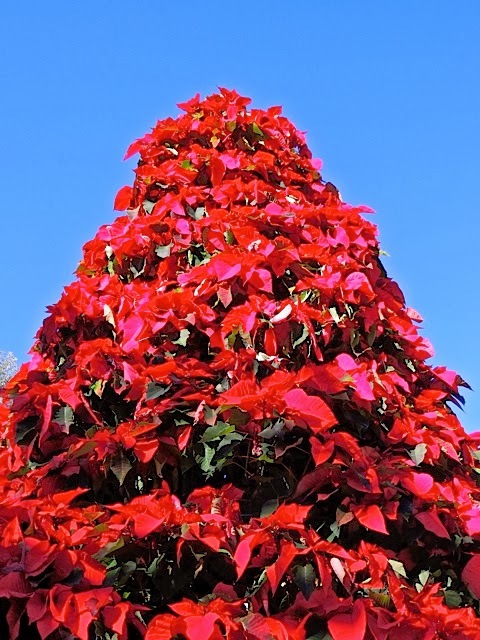 It's crazy busy at the garden right now with the holidays in full swing and lots of out-of-town visitors here. By the time I left it was so crowded that it was getting hard to maneuver among the crowds. I'm glad went early. 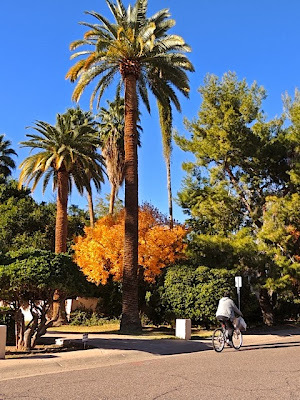 I'm starting to see trees turning colors here in the desert southwest. The fall colors start arriving here after the beginning of winter and when the leaves on trees in northern states are long gone. 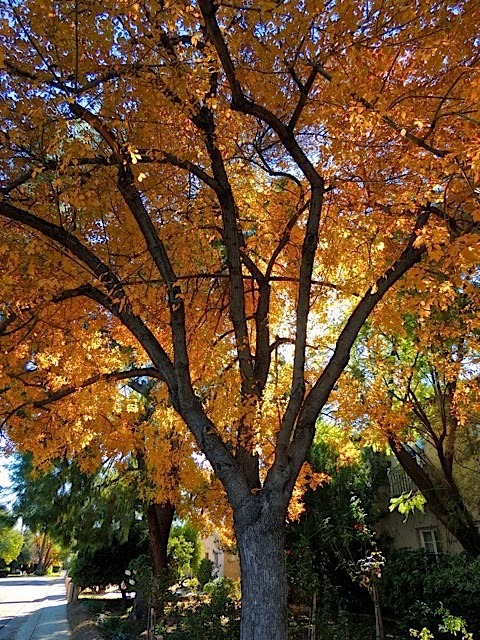 I spotted this tree when I looked down a street and saw a burst of color among all the green in this neighborhood. 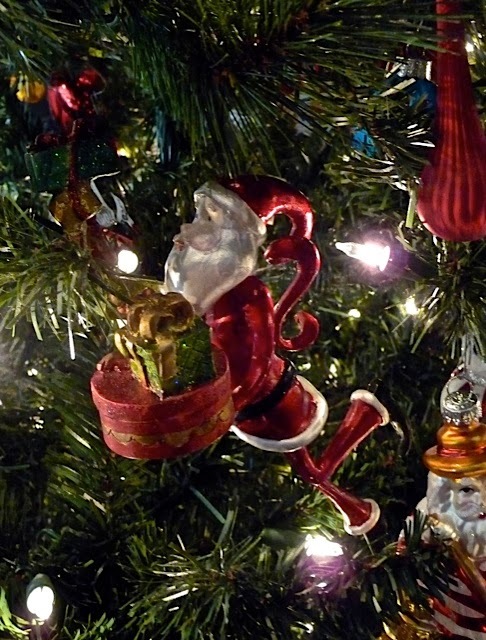 My Christmas tree is full of memories among the ornaments that hang there. The one above I just got on my November trip to London. This one I actually bought here last year at World Market. I hung both of these on the front of the tree so I could enjoy them and think about my trip. So, nestled among my Santa ornaments and a few of the ornaments my Grandmother hung, are little memories from trips and events that I love to remember. However you celebrate, Happy Holidays to all. Happy Birthday to my sister Judy! I had a request from Randy of Santa Fe Daily Photo, to get a photo of the annual poinsettia tree that is always set up in the park area of Biltmore Fashion Square. The times I've been there throughout December, I've always encountered people posing in front of the tree for photographs. I wonder how many of those photos made it into Christmas cards. 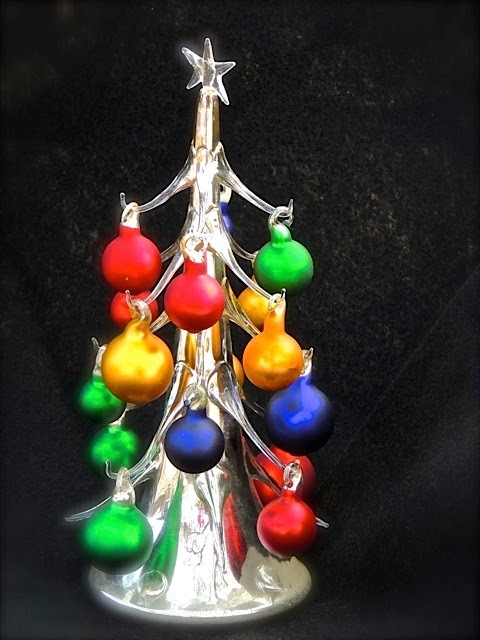 I've had this little glass Christmas Tree for about 16 years. I bought it at a great little gift shop in Chicago when I was working there. While I worked there, I usually flew home to Arizona every other weekend and of course for most holidays. Since I always spent Christmas in Arizona with family, I purchased this little tree to add some holiday decor to my apartment. When I left Chicago, I carefully packed it up and brought home and I've been setting up here ever since. I really do enjoy seeing it every year. I'm glad I don't have hang anything this big! 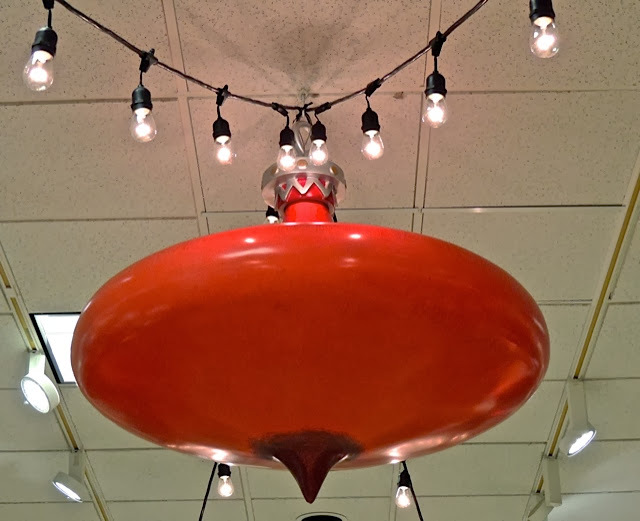 It was inside a store at the mall. Happy Birthday to my sister Pam! 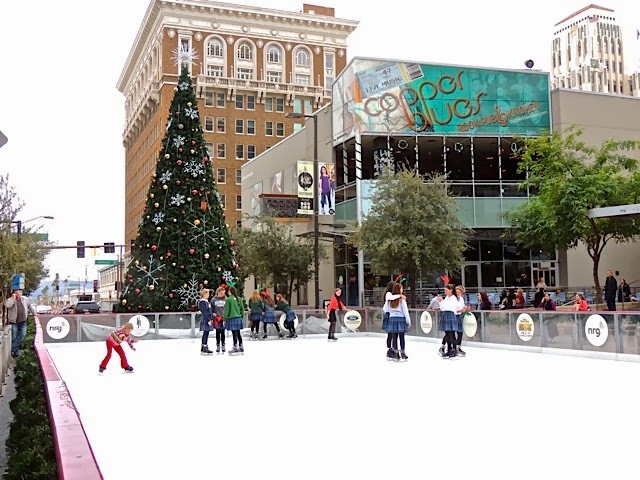 The Holiday Ice Skating rink is back in downtown Phoenix. 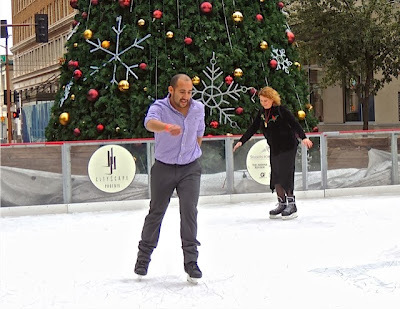 My friend Janet (who takes me to all those great Phoenix Suns games) is now working downtown and she told me I should go down at lunch time to see if I could catch some photos of the business crowd out there skating. She said that they were running a pizza and skating lunch time offer so that people working downtown might take advantage of a little noon time exercise and fun. 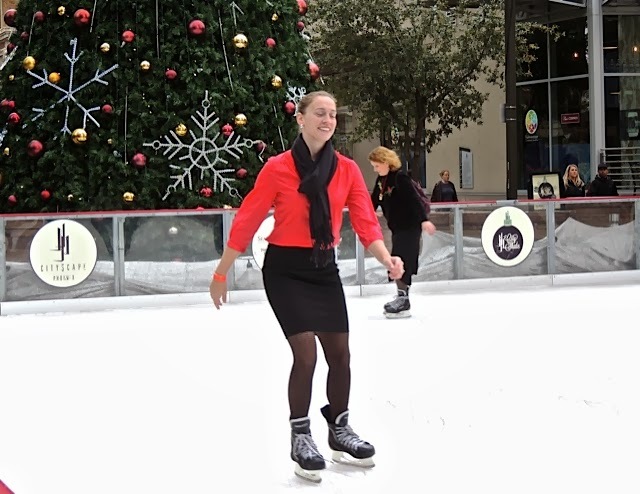 Although I didn't see any men in full business suits, I did see these skaters who were obviously taking advantage of the lunch time offer. In addition to the business people, there were quite a few school girls also taking part in the holiday fun! I took these photos on Friday at noon and I think you can tell from the sky that we were experiencing some winter-like weather. We had rain Thursday night and a little more on Friday afternoon. Way back in 2009, I did a post on Hanny's a new restaurant/bar in downtown Phoenix. You can see the old post here but to summarize, Hanny's is a great place that now lives in a building that used to house a clothing store by the same name. The name is painted on the side of the building and imbedded in the sidewalk at the entrance so the owners decided to keep the name for their new business. 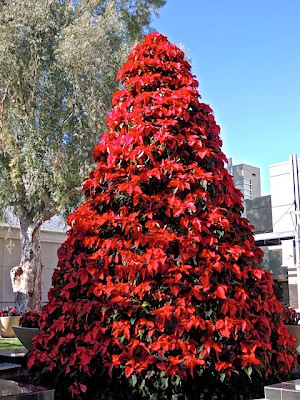 I was there a few nights ago and saw this very unusual Christmas Tree. 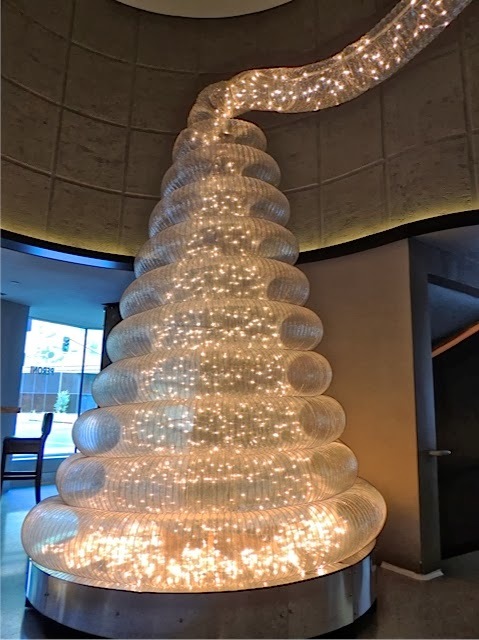 This restaurant company is know for their very eclectic art that changes frequently in all of their restaurants so I guess it's only natural for them to come up with truly eclectic holiday decor. Reminder: the theme for January is "Photo of the Year". I've already picked mine, have you? I've been very remiss in my photography duties the past few weeks and I haven't been out getting any holiday shots. I met David for dinner earlier this week and when I spotted these lights in front of the Esplanade Center I decided I should snap a photo. 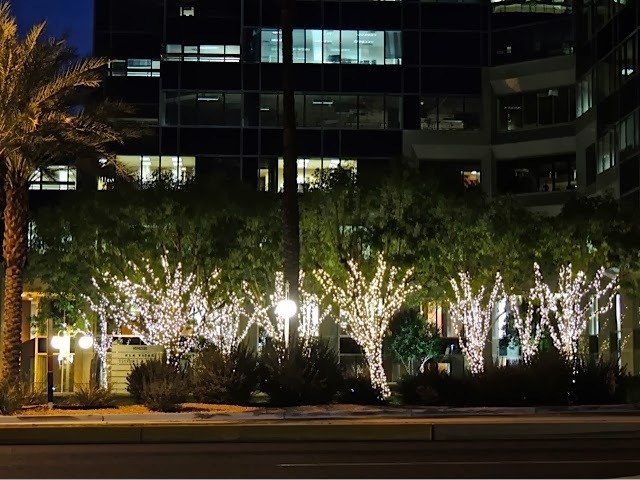 Wrapping mesquite and palm trees in lights is a familiar theme in these parts but, they always look pretty. I'll search out a some more holiday decorations before the big day arrives! 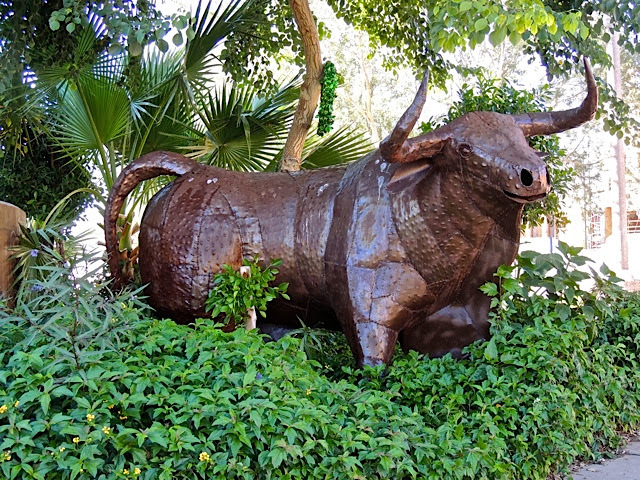 When I was in Scottsdale last weekend I happened to notice this bull standing in the bushes ready to leap out. Since it's located just around the corner from my favorite Scottsdale Mexican Restaurant, I'm not quite sure how I missed it before but there it was. It turns out that it is part of the decor for a Tapas restaurant near by. I might have to try that place sometime soon. That is if I can get past that Mexican Restaurant. It won't be easy! I have a new post on Sharon's Sojourns today. This time I'm engaging in a whim that leads to exploration. 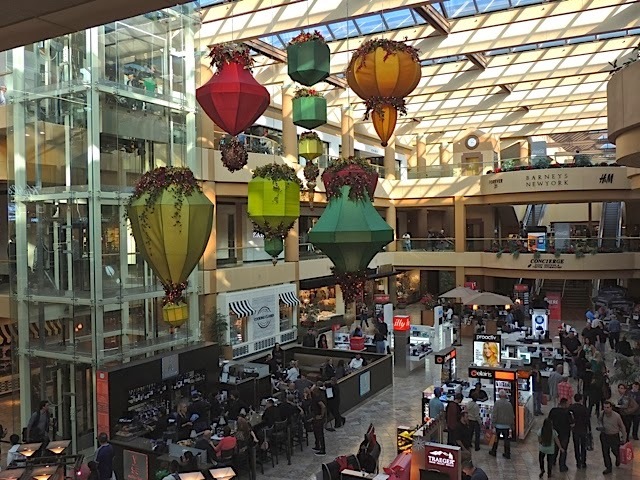 I had a photo of these holiday decorations last year but last year the photo was taken after dark when they were lit up. You can see it here. This year I did some shopping on Saturday during the day so I saw them in the daylight. I have to admit, I like them better lit at night. 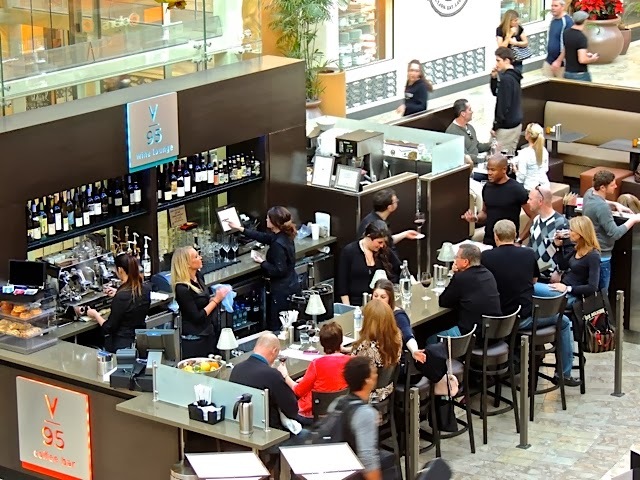 The new thing I noticed was the bar below in the mall. That's a new addition. Gentleman: maybe a little cocktail while your wife is shopping. Ladies: maybe something sparkly to get you in the holiday shopping mood. Cocktail anyone? I didn't this time but, that doesn't mean I won't give it a try sometime soon. My favorite movie theatre is just across the parking lot so I'd say this might be a good pre-movie or after movie spot. 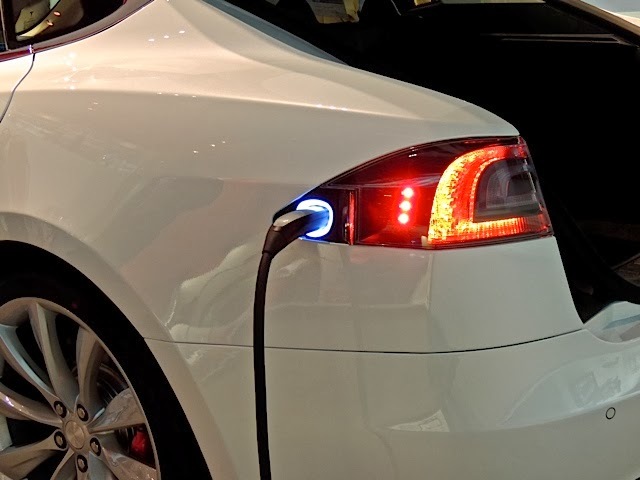 Plug in the car and charge it up! The Tesla car company was started in 2003 by a Silicon Valley group out to prove that electric cars can be great. 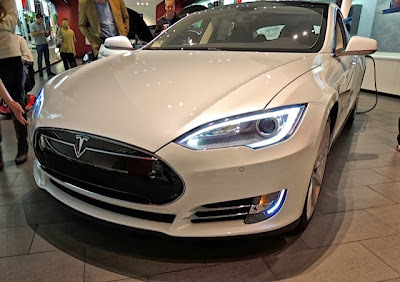 This car caught my eye because the dealership is located inside the Scottsdale Fashion Square Mall. 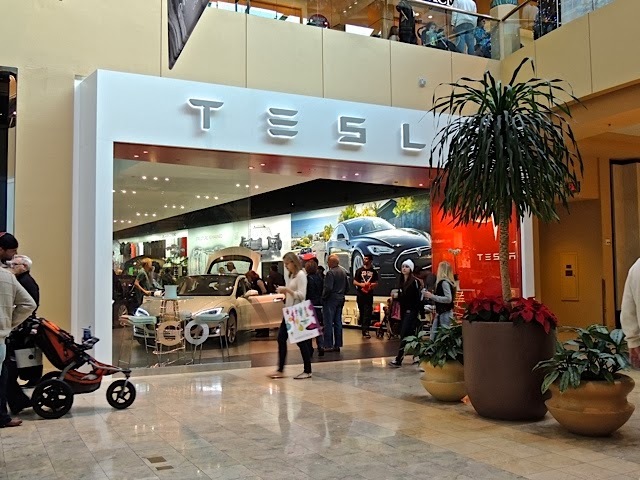 You can get just about anything you might need at this huge mall in Scottsdale, even a new car! 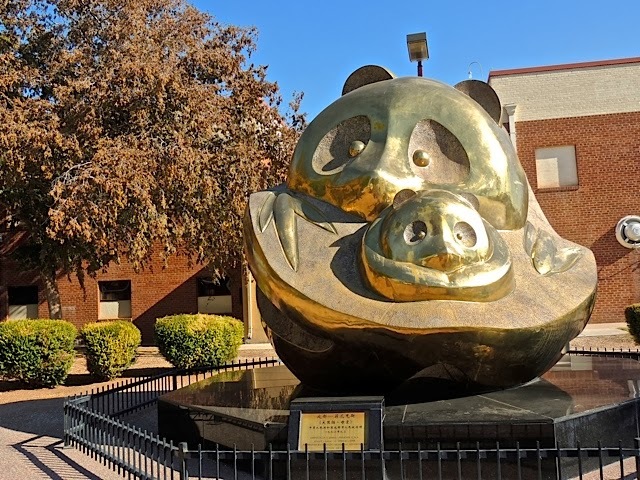 This statue was a gift to Phoenix from sister city Chengdu China in 1996. It's called "Giant Panda - Maternal Love". Chengdu is home to Chengdu Panda Base, a world renowned panda breeding center. The statue has been placed behind the Phoenix Arts Commission building on the edge a park in downtown Phoenix. 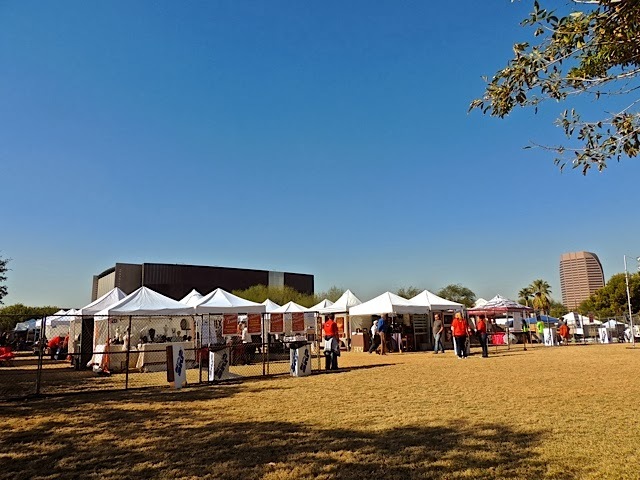 I was at the park on Friday to attend the 2nd annual Phoenix Art Festival. 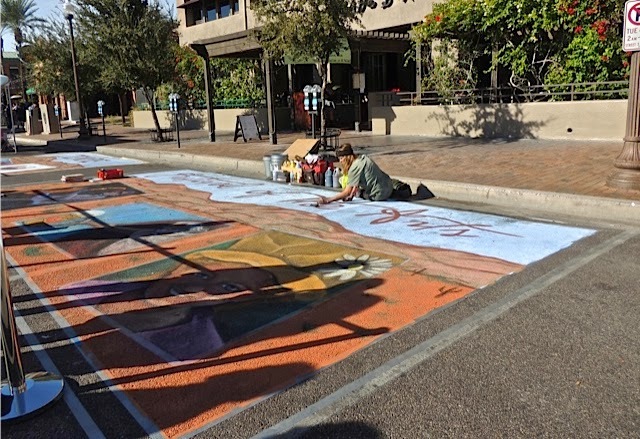 It's not nearly as big as the arts festival in Tempe that I featured last week but it is growing and hopefully will someday be just as big. After all, Tempe has been doing theirs for many, many years. I did find a few things to purchase so it was a success as far as I'm concerned. I have an new post on Sharon's Sojourns today. 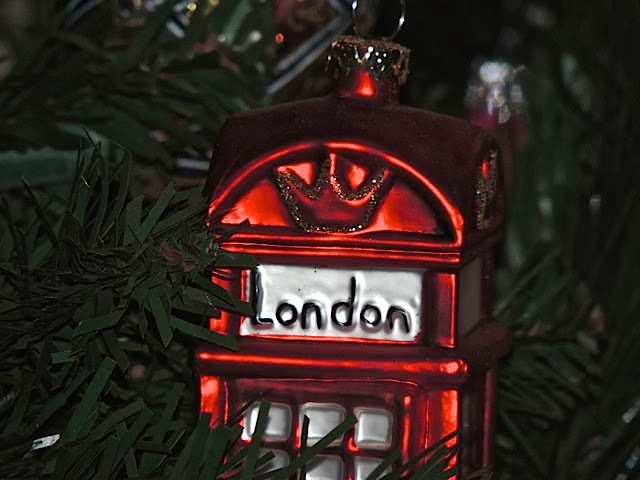 Today I'm featuring my favorite Christmas in London photos. 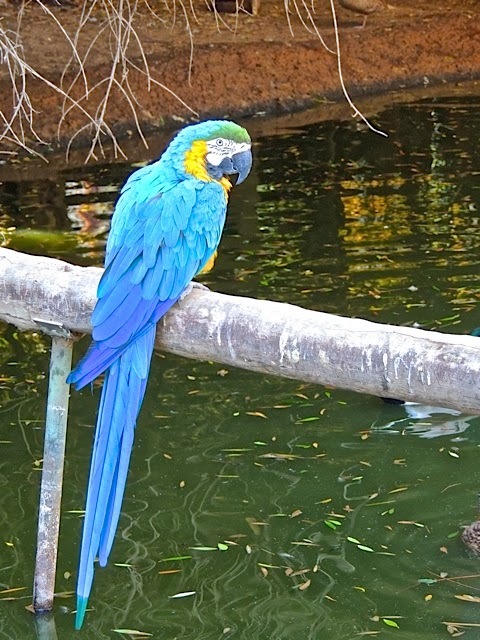 I found this beautiful blue and yellow macaw at the World Wildlife park when I went two weeks ago. Another one near him kept saying "Hello" to me while I was taking pictures. If that one hadn't been in a dark area, I would have captured his picture too. I was walking around my neighborhood when I spotted these berry-like seeds on a tree just across the street from me. 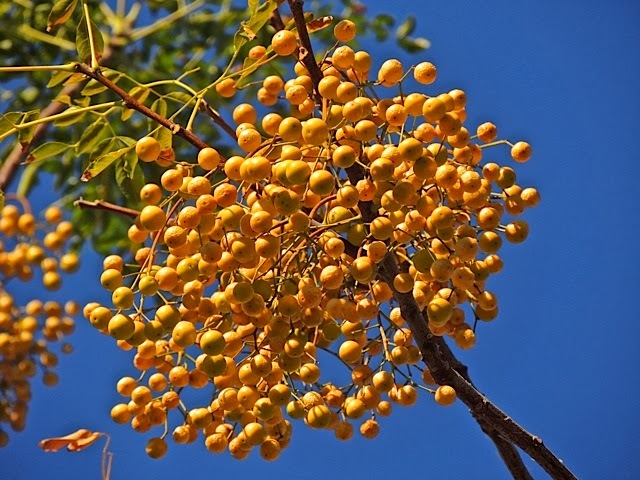 That tree is usually very full so now that the leaves are starting to fall, these berries are more visible. I have no idea how I never noticed them before but, I didn't. I've asked several people what kind of tree this is but, no one seems to know. Anyone out there have any ideas? 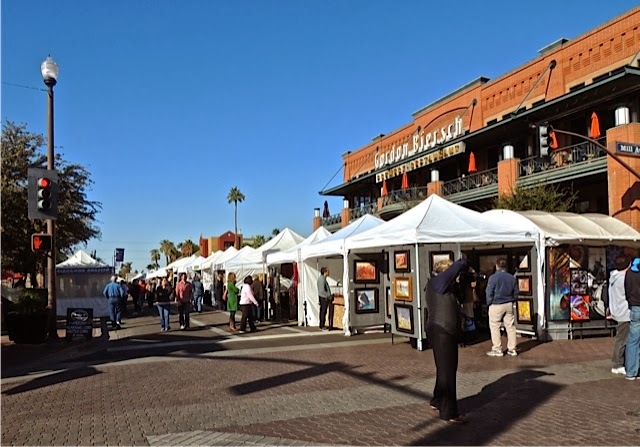 Shopping in Old Town Scottsdale this time of year features all kinds of entertainment besides the obvious shopping. 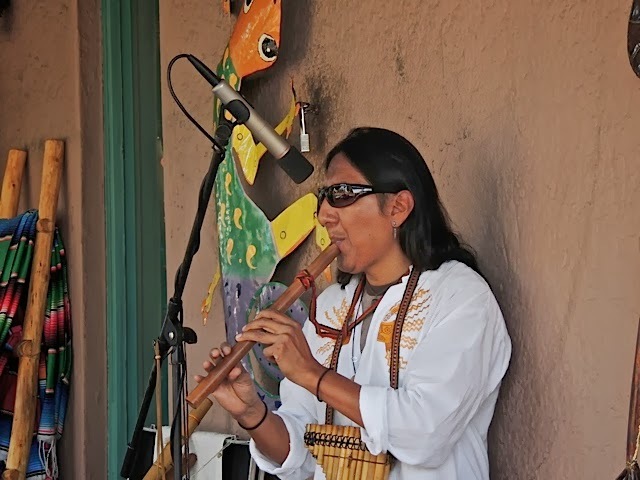 On this day I was serenaded by wonderful flute player! 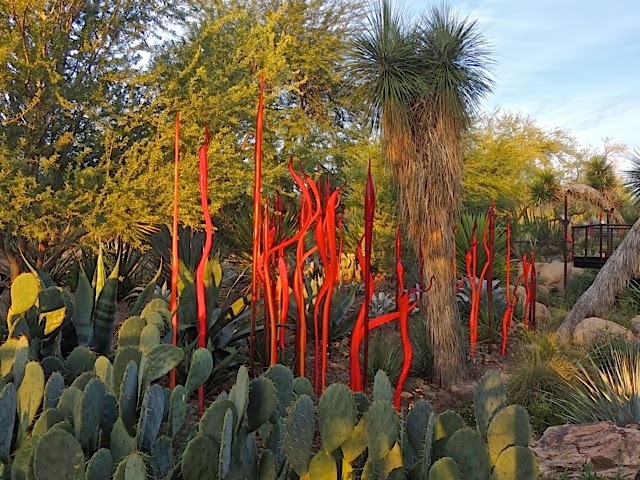 This is another shot from my early morning outing at the Desert Botanical Garden. 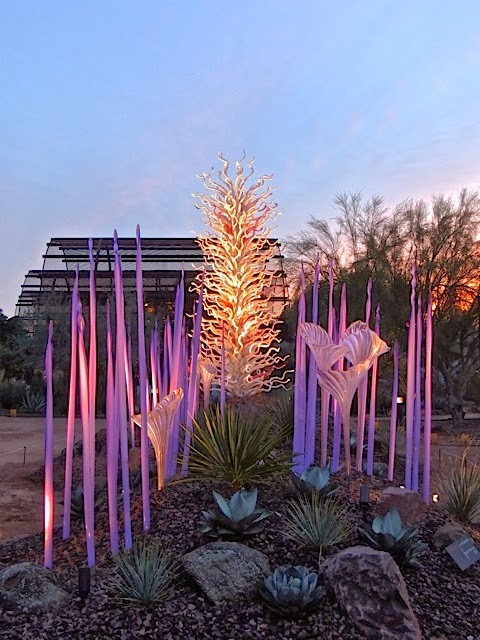 Those Chihuly red reeds brighten a shot that would have been mostly shades of green if they weren't there. I have a new post on Sharon's Sojourns today. 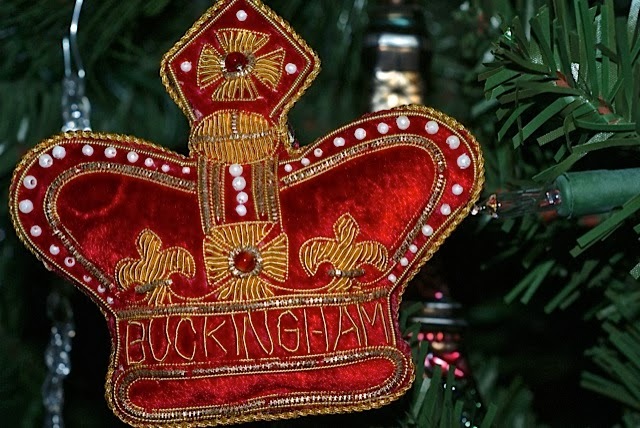 This time I'll feature Christmas in London as the theme. There was entertainment throughout the whole festival, you only had to walk a short distance to see or hear something new. 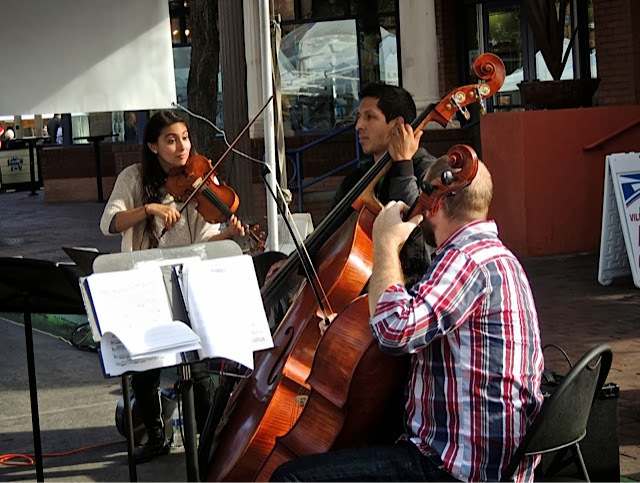 This group called themselves "Simply Three" and they were playing a cool version of classical music. They were great. 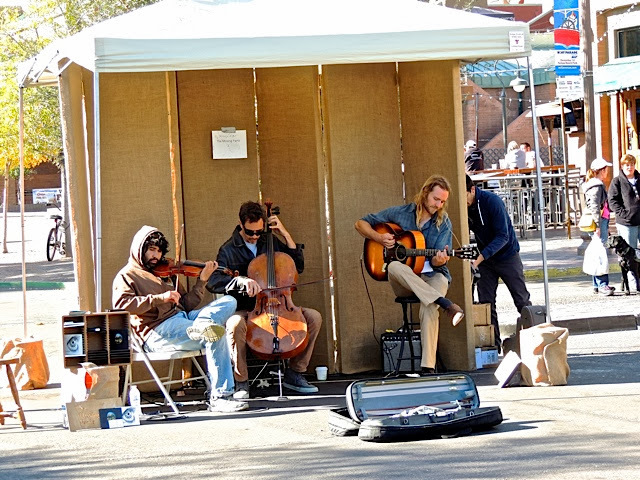 The name of this group is "The Missing Parts" and they had a rather unusual and jazzy take on folk music. Click on the link for a YouTube segment. 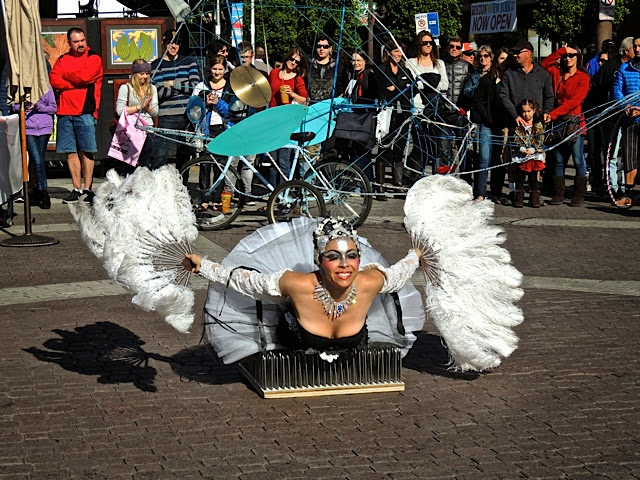 This was one of the more unusual attractions, it was a group of circus-like performers doing fire-eating and juggling and this young lady who performed on a bed of nails. I recommend you not try that at home! Yesterday I went to the Tempe Arts Festival, an event that takes place each December and March in downtown Tempe. 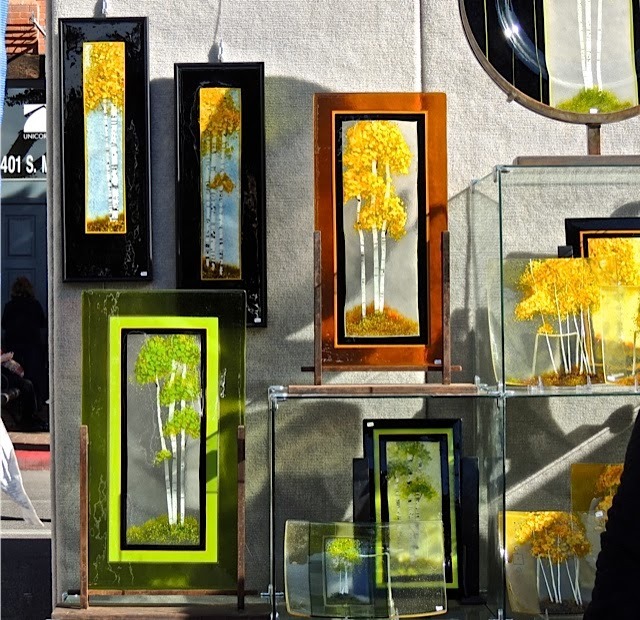 It's a huge arts festival with hundreds of vendors selling amazing art works, photography, jewelry, pottery, and much, much more. 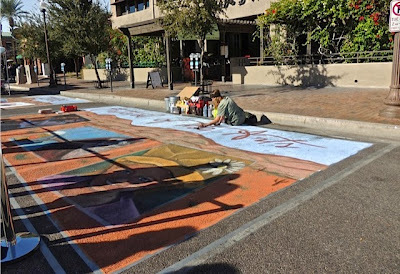 There was some street chalk art being created. And there was plenty of pretty things to look at and buy. Tomorrow I'll show you some of the entertainment that was going on. Last Sunday morning, I got up early and went to the Botanical Garden for the 7:00 AM members only hour. 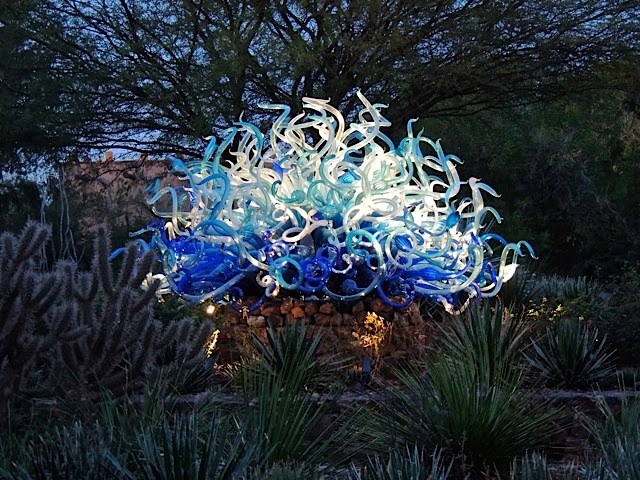 It was still pretty dark when I arrived so I was able to snap a few pictures of some of the Chihuly displays with the spot lights on them. I like the light effects in these shots. The top one is still before sunrise and this one is just as the sun was coming up which you can see in the background. It was a great time to go. There were only two other photographers there at the same time. I have new photos on Sharon's Sojourns today. This time I'm featuring a birds-eye view of London. I'm sneaking in another photo from London but, this time there is a Phoenix connection. 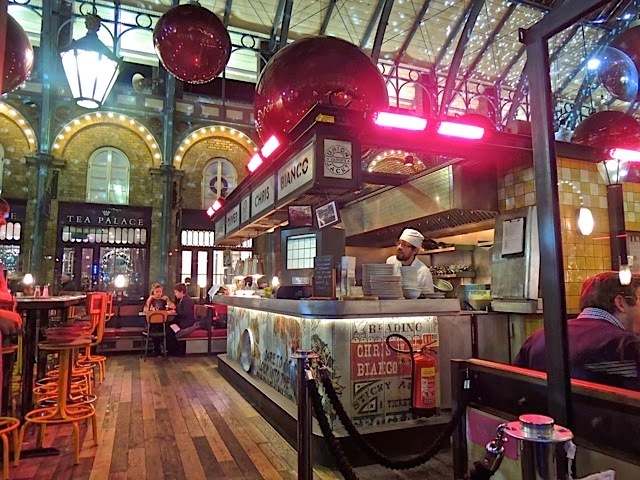 A few years ago I had a post about Pizzeria Bianco in Phoenix right after the restaurant earned the title of the best pizza in the U.S. A year or so ago, Chris Bianco joined with Jamie Oliver to open a pizza place in London at Covent Garden. I searched it out to give the pizza a try. It was great! 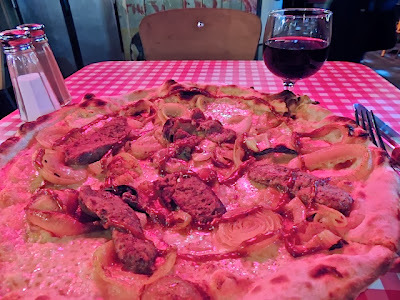 The pizza I had was very similar to one on the menu at the Phoenix restaurant but it had a couple of solid English spins on it. I took this photo of the pizza but, I was sitting under one of those glowing heaters so the color in the photo is a little off. I'm kind of wishing I had a slice of it right now. 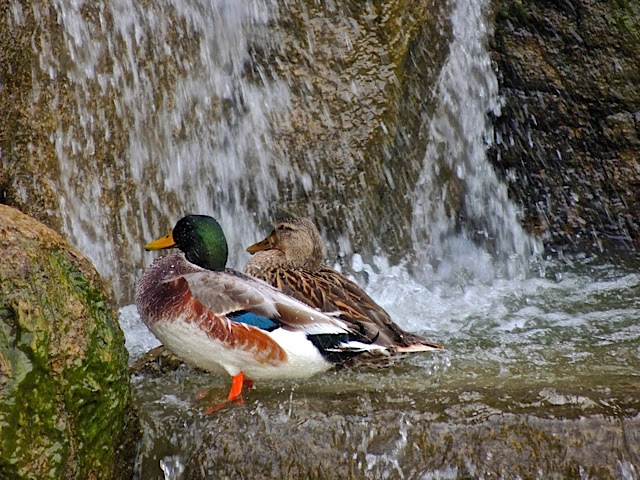 I've heard of couples showering together to save water (I think that's the reason) but, I didn't know that ducks did the same thing. This couple seems to be enjoying a nice shower in the waterfall at the Japanese Friendship Garden. It's amazing the things you can find when go out for an afternoon walk. Last Sunday afternoon I went to the Japanese Friendship Garden to enjoy a walk in the warm weather. While I was there, I saw the water churning below the little bridge and I realized that a young couple were feeding the koi. 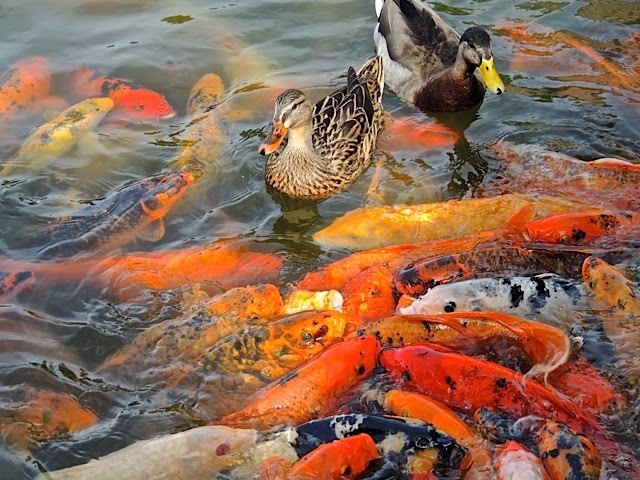 I walked over to snap a few pictures of the feeding frenzy that ensued. While I was snapping a few shots, a couple of ducks swam over to get into the action. 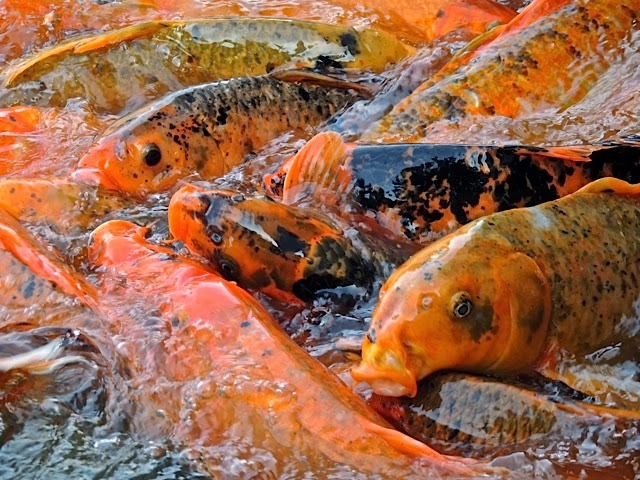 As it turns out, they also enjoy the koi food. Every now and then, one of the bigger fish would give one of the ducks a little push but, that didn't seem to deter their enthusiasm. 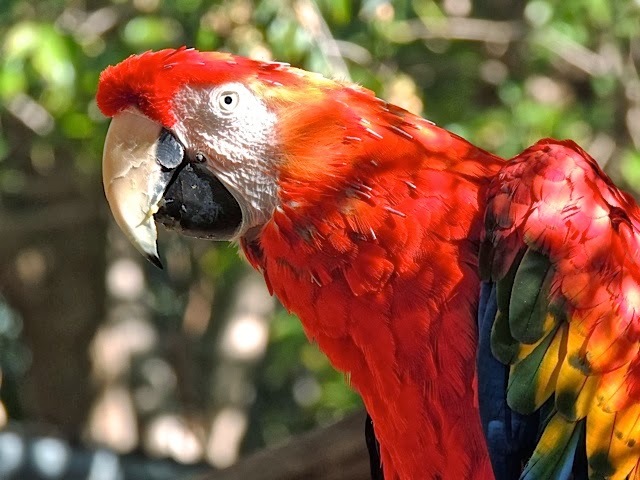 There were quite a lot of birds out and about at the Wildlife World Zoo last Saturday; many kinds of ducks and lots of more colorful birds including this gorgeous macaw. I was impressed by the variety of birds I saw there. 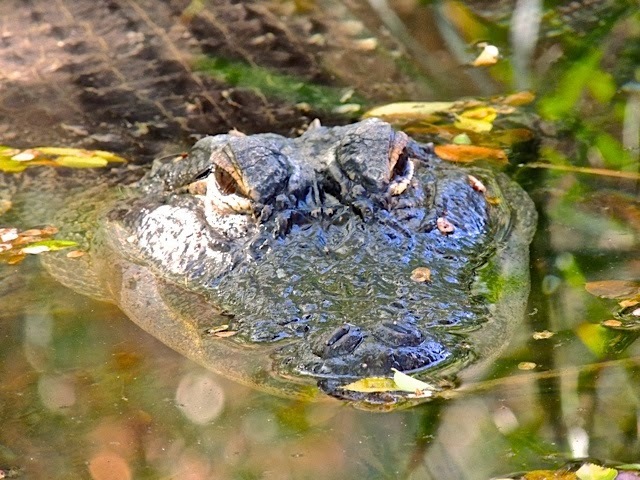 I hope they are all smart enough to stay away from the crocodile compound. I'm pretty sure this fellow would make quick work of a tasty duck or two. 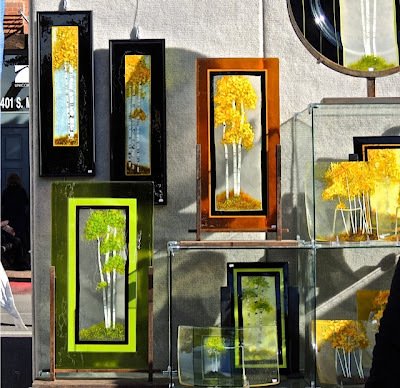 I have a new photo on Sharon's Sojourns today. I'm featuring a photo from my recent trip to London. 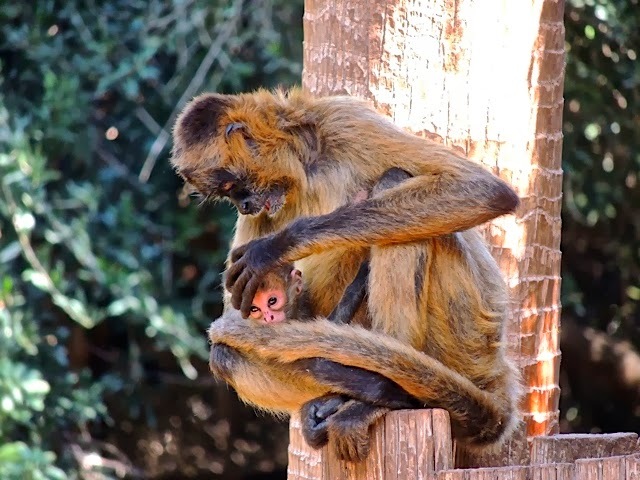 Last Saturday I took a drive way out to the far west side of the valley to visit Wildlife World Zoo and Aquarium. It's been there for quite a while and I had never visited. It was much bigger than I expected and there was a huge variety of animals. 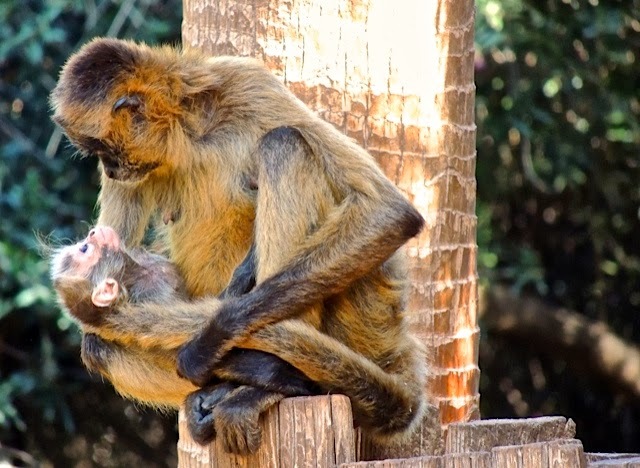 I saw this monkey playing with a young baby. She looks like she's scolding it here. Maybe saying "quit moving around so much". But in this shot, they both seem to be saying "I love you". 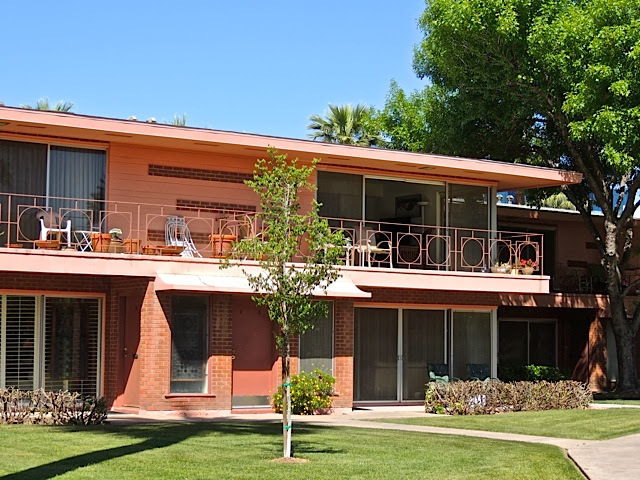 These condos are located just one block from the Phoenix Art Museum and one block from Central Avenue. 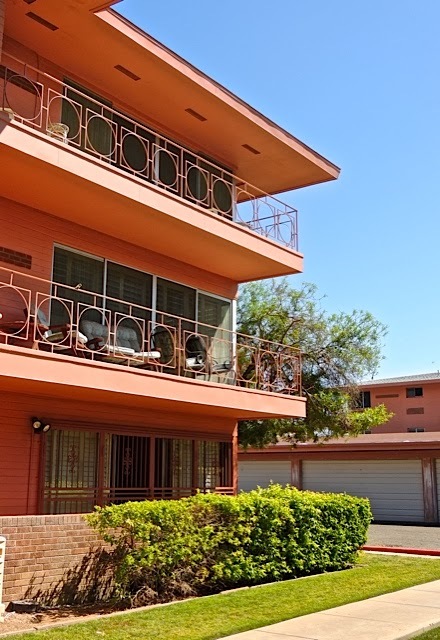 I have always loved the look of these units which I bet were originally built as apartments. I wouldn't mind living here. There is something about that 1950's art deco look that I find very appealing.